Life on Nanchang Lu: Sun! Sun! Sun! At last! The sun is out! 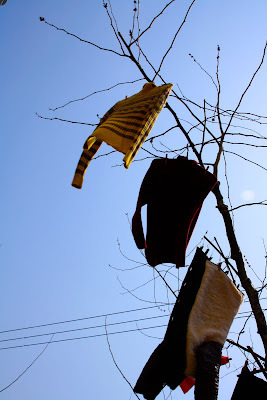 The washing lines, fences and trees all over Shanghai are groaning under the weight of two weeks' worth of wet laundry, and all the bedding and pillows have been put out to air for good measure. People are smiling, a little bit (it is still freezing) and every now and then someone out walking looks up, just to check that the sky today, is in fact, blue.